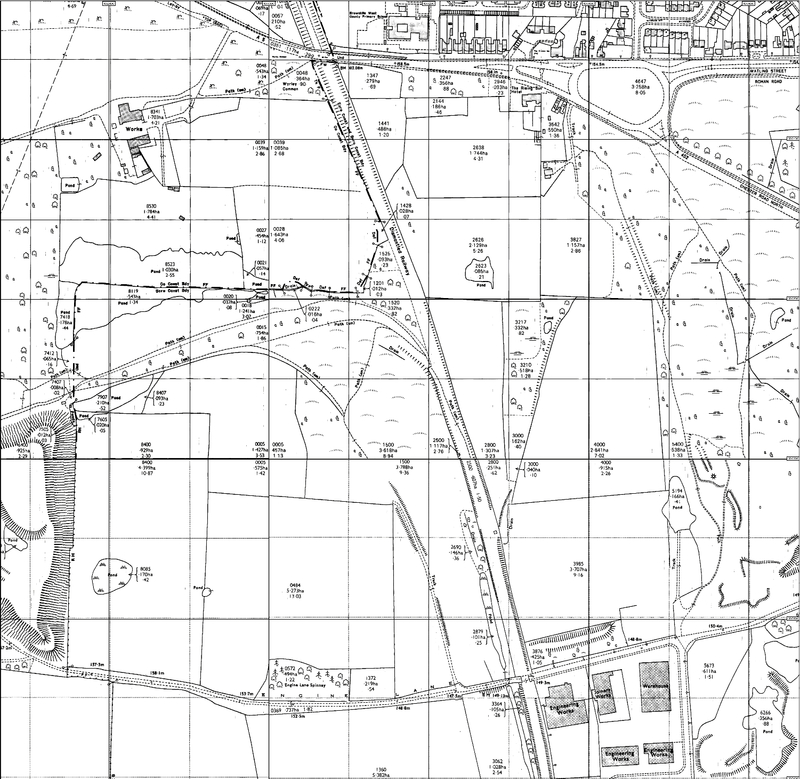 I’m currently trying to find out about he area of Brownhills Common roughly centred around Marklew’s Pond, north of Engine Lane. Today, it’s quiet and a mixture of heath, farmland and wood, but formerly it has been a hive of industry for miners and brickmakers alike. For years, like many explorers of the common, I’ve wondered about the twin shafts that can be found in the copse by the old level crossing at what is now the end of Engine Lane. I’ve been hoping to find out something about them, without any success whatsoever. That having been said, I’ve got some lovely maps of the area. Brick lined, capped with old sleepers at a bout six feet down, terminates a good eight feet above surrounding ground level by means of a built mound. 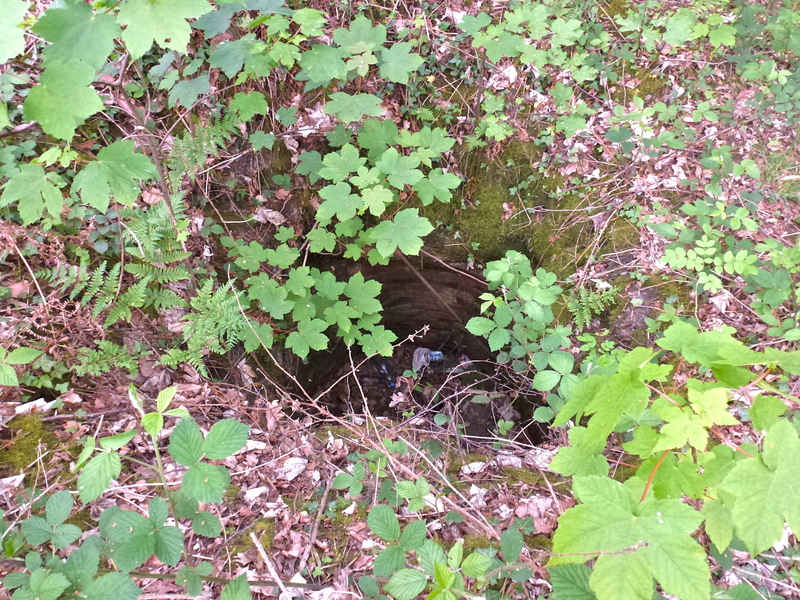 Too narrow to be a coal shft – perhaps an air/ventillation bore. So, I’m open to suggestions, and asking the audience. Any ideas, folks? I know about the Marklew family and their farm here, that gives name to the fishing pool. I’m also aware that they ran the last Tommy Shop in the area. 1884 1:2500 Ordnance Survey plan. Note the brick works and ‘Cathederal Pit’. Click to enlarge. 1919 1:2500 Ordnance Survey plan. The industry has mostly gone. Nothing by the level crossing at all. Click to enlarge. 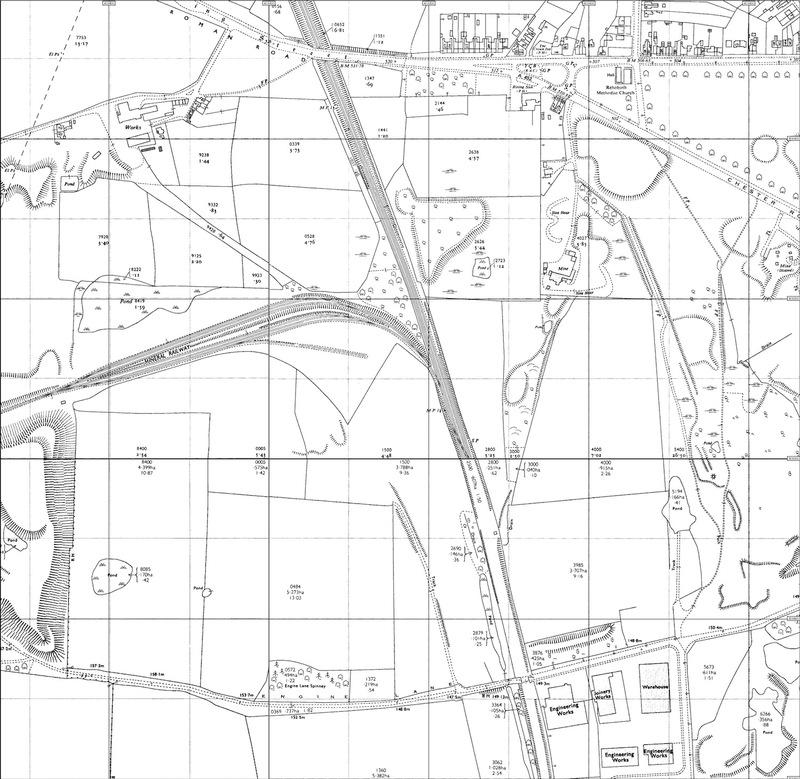 1972 1:2500 Ordnance Survey plan. This has obviously been resurveyed since the ’62 version, annd shows more detail. Sadly, no shafts. Click to enlarge. Hi Bob, i recently made inquiries about Marklews pond regarding the mess it was in. i was informed that it was part of Wyrley estates land, left in trust to the people of Brownhills. a few years back i worked in a elderly gentleman’s house who spent some time talking to me about Marklews pond. the gentleman was called Mr Marklew, however he insisted that he was not related to the aforementioned Marklews farmers. he recalled as a small boy that Marklews pond was a old brick pit (common knowledge), with a road running into it from the end of the pond nearest to engine lane. if you stand by the horse fields and look across the pond, this is the area with a lot of trees in it or hanging over it. he also told me that not long after it was flooded, a local lad who had been rejected by his lover committed suicide in the pond. Mr Marklews father was the local Bobby, and had the gruesome task of finding a couple of boats to net the pool and recover the lads body. mr Marklew was present when they finaly did recover the fully clothed body of the lad. funnily enough, in the same block of flats lived the last landlord/lady of the Jolly Collier. her name i can’t recall just now, however it may come back. she claimed that she was probably the first landlady that most of her customers had ever seen . i wish i had listened more intently to these old timers stories, and even made notes as they were/are a wealth of local knowledge. Many years ago my father told me that during the 26 general strike this part of the common had “unofficial” mining activities…in the part of the common north of Coppice Lane, the part you show in your maps. There were bell-pits dug by some striking miners… and, sometimes ,trees would be seen “sinking into the ground, or just toppling over”. I think there is the remnants of a drift-mine entrance close by. 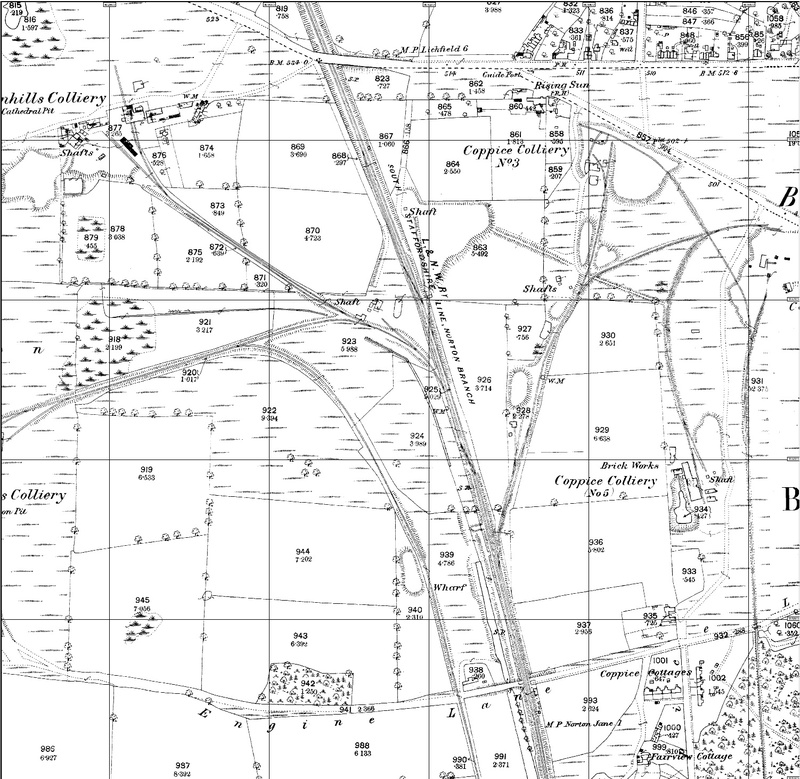 Perhaps there is a link , here, with the hole that apeared in Pelsall Common, by the cross-roads, in the 1960s, which the NCB , though initiallly unaware of the presence of this shaft, very quickly filled in. A round slight depression is all that remains of a large , round shaft. Times were very hard during the strike, and miners had to improvise and collaborate to provide themselves with whatever they needed. Perhaps the Brownhills shafts and other unoffficial holes nearby are some of these legacies from the dark tmes of the past. I would not recommend any person venturing over there! 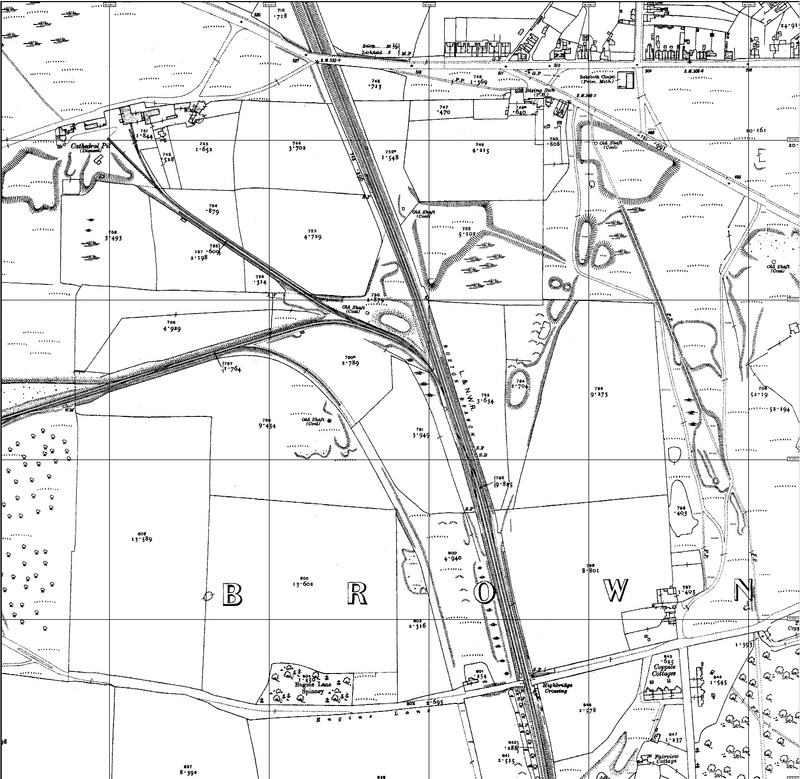 The area where the brick shafts are is marked West colliery (coal & fireclay) on the 1938 map Bob. It’s a relatively small spoil heap maybe it ran into problems that corner of the fields is often ankle deep in water. does anyone know where the “Engine” stood…. in Engine Lane? I understand that the engine was, in fact, a steam-driven pump which was used to drain the water from this part of the common into the nearby canal. Are there any remaining parts of the pump-house building still to be seen anywhere on this part of the common? Was the pump one of Newcomen’s pumps?